The risk of residential fires in urban contexts is complex. A number of factors may operate over multiple spatial scales, and across multiple domains, interacting to influence both the likelihood of a fire event, and the magnitude of its consequences. Factors such as the likelihood and site of ignition, combustibility of materials, perceptions of fire risk, preparedness, risk taking behaviours operate at an individual level, while population and spatial characteristics such as community resilience and urban renewal and development also influence the ability to respond to and recover from fire events more broadly. Consequently, modelling fire risk over large spatial scales is difficult and complicated, but nonetheless vital. As a central part of his PhD Thesis at RMIT, Dr. Rifan Ardianto developed stochastic models to estimate the likelihood of residential fire occurrence in Metropolitan Melbourne to identify key urban characteristics underpinning fire patterns over time and across space. Dr. Ardianto’s PhD Thesis addressed four interrelated key research questions: (i) How does a residential fire pattern occur over time and space? (ii) Can the probability of a residential fire occurrence be predicted as a stochastic process? (iii) How do urban characteristics impact on residential fire risk? (iv) What strategies can be developed to mitigate fire risk in an urban setting? Dr. Ardianto integrated a range of datasets into his research. Many of these related to demographic and social characteristics, which are central to providing insights into the population-based or area-based risks of fire occurrence. Dr. Ardianto sourced most of these datasets through the AURIN workbench, including the NEXIS datasets produced by Geoscience Australia. NEXIS (National Exposure Information System) provides nationally consistent and comprehensive exposure information for different building types. Other variables sourced via the AURIN Workbench included residential mobility, tenure type, English proficiency, residential density, and dwelling type. The key findings of Dr. Ardianto’s research demonstrated that the incidence of residential fires across Melbourne fluctuated seasonally: June-August (winter) recorded the highest fire rates whereas March-April and November recorded the lowest rate of fire occurrence. 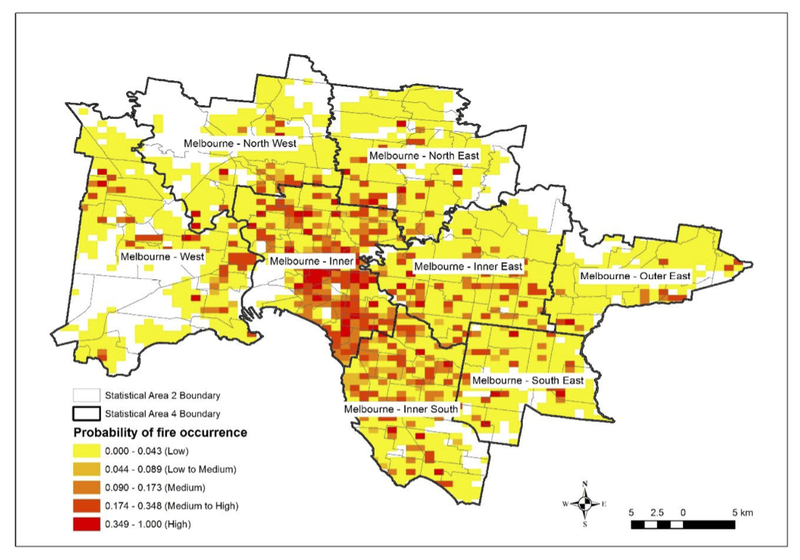 Second, the mapping of the probability of fire occurrence across the Melbourne metropolis showed that fire risks were higher in the inner subregions of Melbourne compared with the outer subregions. Dr. Ardianto’s research also showed that fire risks in a neighbourhood decreased for approximately two months following a fire event, before returning to a normal baseline. Importantly, the research also showed that the distribution of residential fires across Melbourne is associated with both neighbourhood attributes that vary over time and space. The effect of neighbourhood and social characteristics such as language, residential mobility, home ownership, type of dwellings, and dwelling density is inconsistent across urban areas. The findings of this research provide new evidence, useful for fire agencies looking to find way to reduce the potential negative impacts of fire on communities. The research can also help to identify high fire risk areas, and to target more appropriately, in terms of when and where to disseminate fire safety information to reduce the risk of residential fires.